089. ROALD AMUNDSEN. 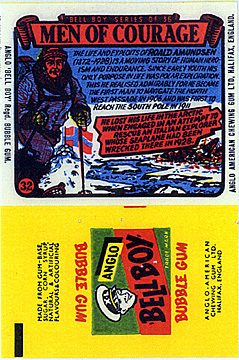 Issued by Anglo-American Chewing Gum Ltd ('Bell Boy' Bubble Gum). (1950s). Card number 3221 from a set of 36 entitled "Men of Courage". Size: Ca. 3.9" x 2.62".